Since I have not had time to implement a web page update for quite some time, I’ll include LOTS of customer agate finds. First, let’s start with one of my favorite agates found this summer. This candy striper was found by Andrea from Troy, MI. Next is a Becky B from Pittsburgh, PA She found this ¾ pounder that has a carnelian center with white floater bands just to the left of the boardwalk right in town. Of course, the wind and waves were blowing for three days prior to her find, which helps to mix up and bring new rocks up the beach. Bonnie (Singleton) Parker from Newberry, MI came by the Rock On agate show in Deer Park to show me her terrific finds. The one in the upper left looks like a Botswana, Africa agate, but Bonnie swears she found it on the Lake Superior beach. I totally agree that she did. 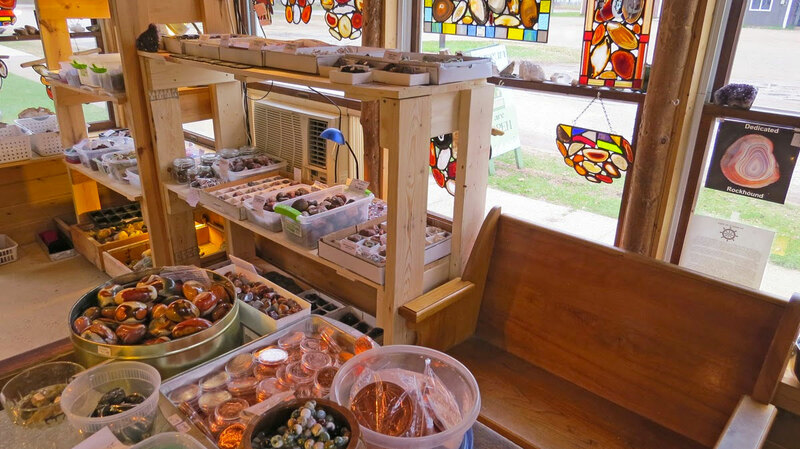 It just goes to show you that when it comes to agates, there are no absolutes. I don’t have a picture of Gary Darling, but here are a couple of shots of a 15 ounce agate he found east of Grand Marais. Last but not least is the nicest large agate I’ve seen this summer come off the local beach. Local resident, Cathy Goulet, was walking her dog down the beach when she saw this 1.33 pounder rolling in the pea gravel. It is a jasper agate, but it has incredible banding! I don’t have a picture of Cathy, but I was able to get a few shots of her incredible agate!